Vital Conflicts in Medical Ethics by renowned Swiss philosopher Martin Rhonheimer considers some of the most difficult and disputed questions in Catholic moral theology. With great rigor, he addresses classic dilemmas including the morality of the procedure known as craniotomy, and of various treatments for tubal pregnancy. Rhonheimer's approach, grounded in his retrieval of Thomistic virtue ethics, supports the encyclical Veritatis Splendor in showing how these cases can be resolved without recourse to the revisionist method of 'weighing goods'. The debate that ""Vital Conflicts"" addresses traces back to late-nineteenth century declarations of the Holy Office, which directed that Catholic institutions were prohibited from teaching that the craniotomy was a licit procedure; this teaching had restrictive implications for related cases. 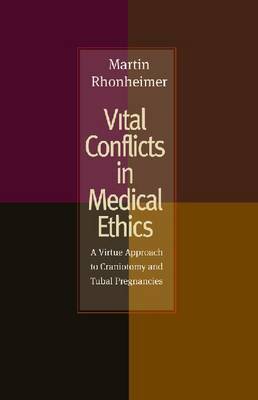 In this book, his newest work to be translated into English, Rhonheimer analyzes the morality of different procedures that might be employed in cases of 'vital conflict', where the life of the embryo or fetus cannot be saved, while that of the mother can be saved, but only through a procedure that traditional moral theory would judge to be a 'direct', and thus illicit, killing. These traditional conclusions, however, are not easily accepted because they contradict the basic principle of medical practice that requires physicians to save lives when possible. To resolve this aporia regarding cases of vital conflict, Rhonheimer clarifies fundamental aspects of moral theory, such as the meaning of the prohibition against killing, makes a case that prior analyses are unsatisfactory, and proposes his own solution.